My husband and I just got back from the beautiful area of San Francisco! While we were there, we got to visit my husband’s brother and his wife and fix them this dish for dinner. We were unable to be with them for their 40th anniversary party earlier this summer, so I thought it would be a wonderful idea to fix them dinner as a way to celebrate them. I loved hearing my sister-in-law say, “I felt pampered and loved!” Mission accomplished!!! To me, this dish comes under the genre of Mexican cooking. It was my sister-in-law, whom we just visited, that prepared my first Mexican dinner 33 years ago when I was dating my husband. From that day on, I have loved this type of cooking and all the flavors. I actually found this recipe in a Cooking With Paula Deen magazine five years ago. It is a regularly prepared dish in our household. You can never go wrong, in my opinion, when bacon is in the recipe!! Preheat over t0 350 degrees. Spray bottom of baking dish with non-stick spray. In a small saucepan, bring water to boil over high heat. Stir in rice; cover, remove from heat and let stand for 5 minutes. Stir in cheese, tomato, sour cream, salt, cumin and chili powder. Cut a slit lengthwise in each pepper. Carefully scoop out seeds and membrane. (NOTE: Do not place your hands/fingers near your eyes while doing this; wash your hands well when you are done) Spoon rice mixture into peppers. Wrap each pepper with 2 strips of bacon to completely enclose filling. Place peppers in baking dish. Bake in oven for at least 60 minutes. If you want a smoky/grill flavor, warm up the grill (grill should be at 350 – 400 degrees) and cook them for an additional 15 minutes on the grill. I love how these taste when they have been smoked on the grill. I like to cook mine for an hour in the oven before putting them on the grill because the peppers get soft and the flavors all meld together. Bacon should be crispy when they are done. Serve immediately. 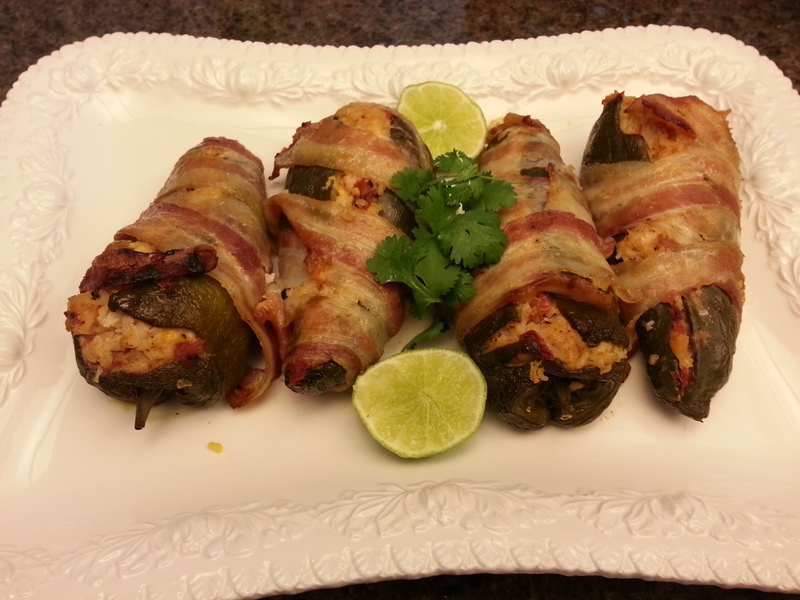 If you want to make these a day in advance or early in the morning, you can put the peppers together with the rice mixture, but I would wait to add the raw bacon until you are ready to cook it. Optional: You can add cubed, cooked chicken to the rice mixture if you want more protein in the meal. This is real tasty too!